Are you looking for the best soft cooler? Soft coolers, bags and chests are a convenient way to keep your beverages and your food cold. They are portable, easy to maneuver and highly functional. These coolers can be used for numerous activites, such as, sporting events, camping, picnics and even transporting frozen foods from the grocery store on home. In our household, these soft-sided coolers rarely go anywhere without us. Even if it’s empty, it goes in the car for that “just in case” moment. And, having the best soft cooler can mean the difference between a cold beverage or a hot beverage – in this case, we tend to err on the side of a cold one. The best soft cooler will be able to retain its inside temperature for hours – even days – in the hottest of environments. Ever pop open a hot one? Well, we used to until we got smart and decided to go with a quality cooler. And, not only will the best soft cooler be able to retain its heat, it will retain melted ice. That means, no more leaks and no more mess once the ice melts. The best soft cooler is durable and able to withstand the abuse you put it through. Whether you’re headed out for a week-long boating trip or trekking out to the middle of the desert, the best soft cooler will be virtually indestructible. Once a soft cooler gets punctured, ripped or shredded, it loses its capability of retaining its inside temperature and we don’t want that – nobody wants that. Lastly, the best soft cooler has got to look good. If we are going to be lugging this thing around, we are going to do it in style. So, our final 7 picks for best soft coolers, bags and chests not only look good, they are capable of giving us days of cold brew without worry. And, that’s basically what it comes down to. The best cooler will give us the freedom to enjoy our adventure and the company we keep without sacrifice. Our first pick is one of the most sought after soft coolers on the market. The Yeti Hopper Two 20 is rugged and will endure pretty much any adventure you take it on. This soft cooler features an FDA approved, food-grade DRYHIDE™ SHELL liner made of high-density fabric. This liner is waterproof, mildew-resistant, puncture-resistant and abrasion-resistant. In addition, it is resistant to UV rays. And, this soft cooler comes with COLDCELL™ insulation. COLDCELL™ is a closed-cell insulation to keep ice frozen for days. 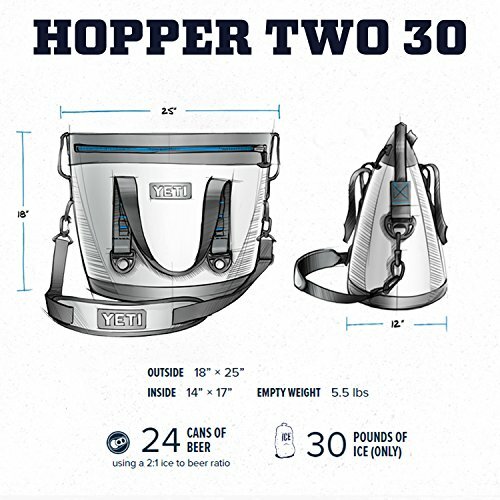 The Yeti Hopper Two 20 is built with a Hydrolok zipper, designed after Hazmat suits, which allows this soft cooler to retain its temperature. Futhermore, the Hydrolok zipper is leakproof and will keep melted ice and other liquids from leaking. And, if that’s not enough, the Yeti Soft Cooler is extremely functional. 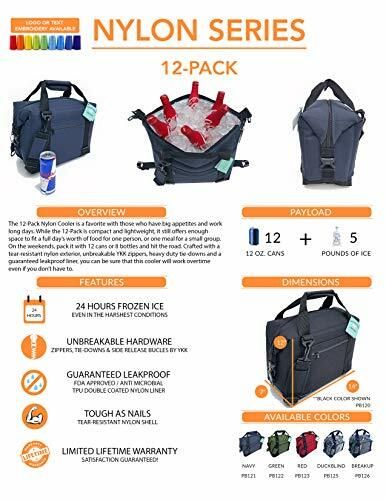 It features a wide opening for easy access, a tapered body for a comfortable trek, indestructible and adjustable straps, reinforced handles and 6 D-ring, tie-down points to give you multiple ways to secure this cooler. In addition, it comes with a hitchpoint to attach keys, tools, a water bottle…you name it. The Yeti Hopper Two 20 measures 22 inches wide and 16.5 inches tall on the outside, while the inside measures 15 inches wide and 12.5 inches tall. It has a weight of 4.4 pounds when empty. Finally, this soft cooler comes in your choice of color combinations. Choose between Field Tan/Blaze Orange or Fog Gray/Tahoe Blue. Additionally, you have your choice of sizes: Hopper Two 20, Hopper Two 30 or Hopper Two 40. This pick for best soft cooler will keep the ice frozen for a full day with temperatures up to 90 degrees Fahrenheit. The Coleman 24-Hour 30-Can Cooler has extra insulation with a zippered main compartment that will help seal in the cold and keep the heat out. Additionally, this soft cooler features an antimicrobial liner which is resistant to odor, mold, mildew and fungus. 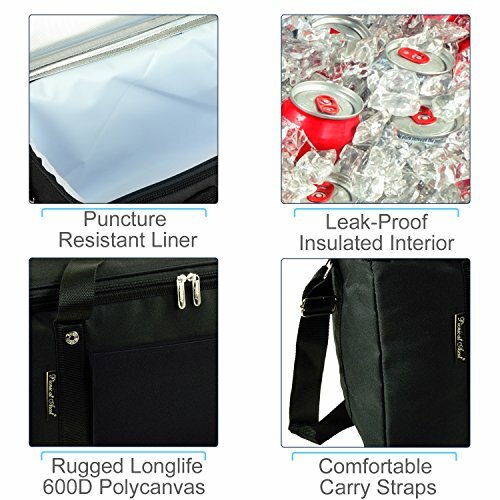 To prevent leaks, this soft cooler comes with heat-welded seams. It also comes with rip-stop fabric to help prevent tears. 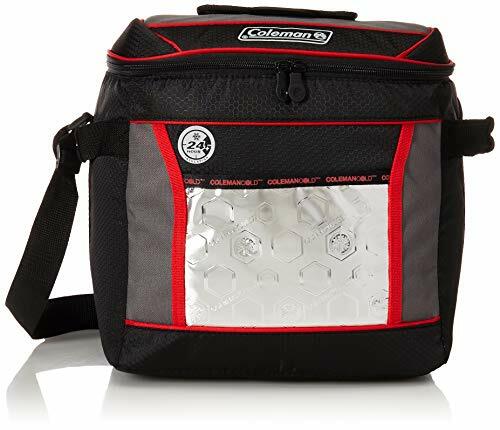 The Coleman 24-Hour 30-Can Cooler has a front pocket to store snacks, an adjustable shoulder strap and side handles for easy maneuvering, as well as, easy grab-and-go. Furthermore, this soft cooler has a top hatch in the lid for easy access. Finally, the Coleman 24-Hour 30-Can Cooler measures 12.2 inches deep, 12.99 inches tall and 9.45 inches wide. And, it weighs roughly 3.3 pounds. This soft cooler comes in your choice of sizes. Choose between the 20 Soft Pack, 30 Soft Pack or 40 Soft Pack. Additionally, it comes in your choice of colors and color combinations: Black, Blue & Grey, Blue/Grey, Kanati, Rift Blue, Strata, Viper, Viper Snow and Blue. 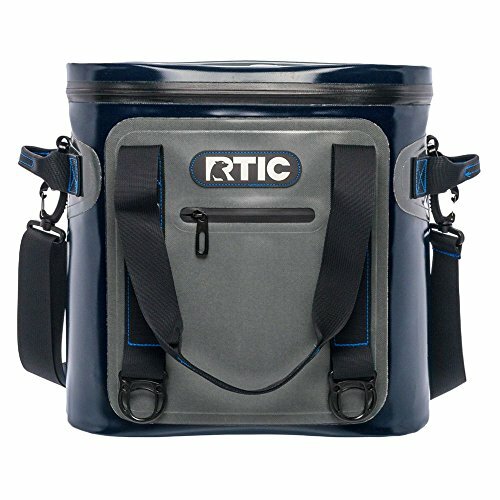 The RTIC Soft Pack will keep ice frozen up to 5 days. It features 2 inches of closed-cell foam insulation with an antimicrobial liner that resists mildew. It also features laminated fabric, welded seams and a heavy duty nylon shell which is puncture and tear resistant. This soft pack offers a leak-proof zipper while the exterior is sweat-proof to keep the outer parts dry. Furthermore, this cooler is covered with 100% StayDry Material which is 100% waterproof. The RTIC Soft Pack is durable and lightweight, with the 20 Pack measuring in at 13.75 inches tall, 13.5 inches wide and 9.5 inches deep. And, the 20 Soft Pack weighs 3 pounds. This pick for best soft cooler is quite impressive. The AO Coolers Water-Resistant Vinyl Soft Cooler is guaranteed to hold ice for 24 hours in 120 degree weather. The outer material is made of 1000 denier vinyl while the liner is made of high quality TPU. TPU is the same material used to make waterbeds so this soft cooler is one tough cookie. It is resistant to impacts up to 375 pounds, abrasions and tears. In addition, because it is made of TPU, this soft cooler is as waterproof as you can get. Furthermore, the AO Coolers Water-Resistant Vinyl Soft Cooler is leakproof, sweat-proof and anti-mildew. The inner insulation is made of 3/4 inch thick, high density, closed-cell foam. And, not only will it keep things ultra cool, it can keep things warm as well. So, if you’re going to a potluck or a barbecue, feel free to use this for your specialty hot dish. This soft cooler comes with a removable and adjustable shoulder strap and handles for easy maneuvering. It also has a side exterior pocket for dry items. Finally, the AO Coolers Water-Resistant Vinyl Soft Cooler comes in your choice of colors: Black, Royal Blue and Silver. It also comes in your choice of sizes: 12-Can, 24-Can, 36-Can and 48-Can. The dimensions of the 12-can soft cooler are 14 inches long, 7 inches wide and 12 inches tall. This pick for best soft cooler is a great budget option. And, the Igloo Marine Ultra Square Coolers come in a wide range of styles and sizes. Not only do they have the square coolers, they have a console cooler, backpack cooler, cooler bag and snap-down cooler.This soft-sided cooler offers 1.1 inch thick, extruded, closed-cell foam that will keep ice frozen up to 2 days. It offers an antimicrobial liner which is stain resistant and odor resistant. 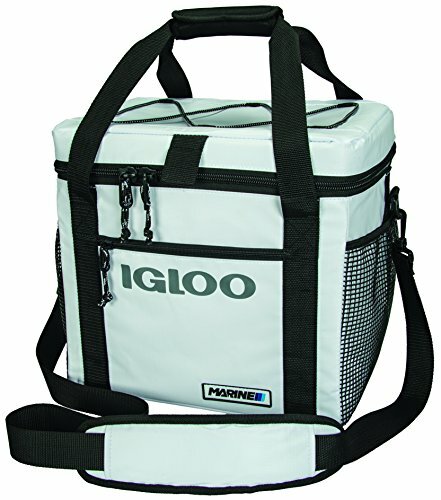 In addition, this soft-sided cooler is anti-mildew and UV protective.The Igloo Marine Ultra Square Coolers features a front zip pocket and side mesh stash panels to store dry goods. Furthermore, this soft-sided cooler has non-corrosive hardware and non-slip feet for stability and to keep the underside of the cooler clean. And, there is a comfortable, adjustable shoulder strap and side handles for easy maneuverability.Finally, this soft-sided cooler measures in at 16.75 inches in length, 12 inches in width and 15.53 inches tall. The Polar Bear Coolers Nylon Series offers high-density, open-cell foam insulation to provide a minimum of 24 hours of frozen ice. And, because it is open-cell foam insulation, this soft cooler will have less heat resistance than our other picks on our list with closed-cell foam insulation. However, if you are looking to use a soft cooler to keep things cool for less than 24 hours, this is still a great pick. The Polar Bear Coolers Nylon Series comes with a rugged 1000D Nylon exterior that is resistant to rips, scratches and tears. In addition, this soft cooler has YKK zippers which are unbreakable. This soft cooler has a durable interior liner that is FDA approved TPU double-coated nylon. And, not only is it durable, but it’s waterproof, leakproof and keeps the outer cooler sweatproof. The Polar Bear Coolers Nylon Series breaks down to half its size for easy storage. It comes with an outer side pocket to store dry goods, an adjustable shoulder strap and side handles. Finally, this soft cooler comes in your choice of sizes: 12-Pack, 24-Pack, 48-Pack and a Backpack. It also comes in your choice of colors and color combinations. Choose from Black, Break Up, Duck Blind, Green, Navy, Orange or Red. Our final pick for best soft cooler is great for casual excursions, family outings and trips to the grocery store. The Picnic at Ascot Collapsible Folding Insulated Cooler has the capacity to hold 3 brown paper shopping bags.This folding soft cooler is made of 600 Denier polycanvas exterior with a sewn-in wire frame and side supports. 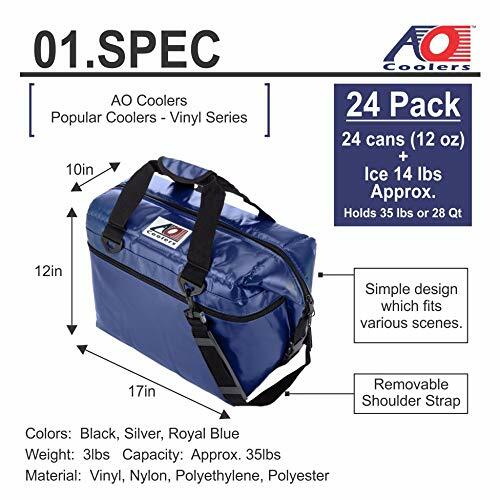 And, the durable frame and side supports collapse for easy storage.This soft cooler has high-density, open-cell thermal insulation which will keep things cold for up to 18 hours with 25 pounds of ice. In addition, this soft cooler is leakproof, food safe and heat welded with puncture resistant lining.The Picnic at Ascot Collapsible Folding Insulated Cooler has an adjustable shoulder strap and side handles for easy maneuvering.Finally, this soft cooler measures 21 inches long, 10 inches deep and 10 inches tall. It comes in your choice of color and color combinations. Choose from Black, Granite Grey/Green, Houndstooth, Navy, Orange/Navy, Trellis Blue and Trellis Green.